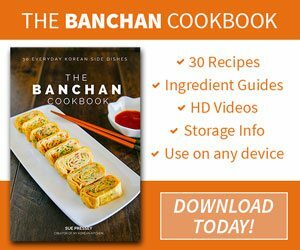 Let’s explore what Korean pear is and how it can be used in Korean cooking! The picture above has a few different names it goes by; Korean pear (Bae, 배), Asian pear and Nashi pear. Korean pear is my favourite type of pear in the world! The flesh is firm but marvellously juicy and sweet. It has a nice crunchy texture as well. Though its skin is a bit rougher and thicker, so you don’t eat the skin. The only downside I can think of about this pear is that it comes with a pricey tag, even in Korea, and it’s not easily available in most parts of the world. One of the obvious ways to eat Korean pear is eating it as fruit. Just peel the skin with a vegetable peeler or a fruit knife and slice it to bite size pieces and enjoy. 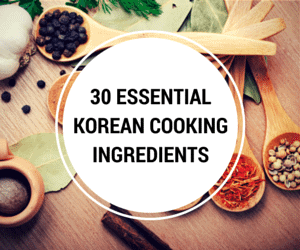 However, it is often used in Korean cooking as well. Typically Koreans add the pear when they marinate meat (e.g. Bulgogi) because it makes the meat tender. Apparently the enzyme called ‘calpain’ does this part. When it is not available (for making marinade), you can substitute it with kiwi or pineapple as well. But I prefer using pear as it’s less risky. Kiwi and pineapple can over tenderise if you use them too much or marinate with them for too long. Another possible substitute is Bosc pear. It’s not as juicy and sweet as Korean pear, but it has some similarity. You can also make some pear dessert or natural cough remedy with it. 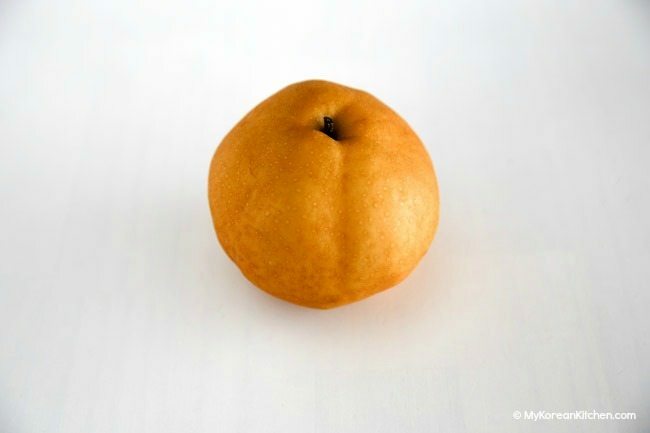 Korean pear is available at some Korean grocery stores and some greengrocers if in season. To make it easier for everyone, if any of you have seen it where you live, please let us know! P.S. I just noticed that Amazon US sells them online! How convenient! When my sister and I lived in South Korea as young teenagers for a year, we were presented with this unusual fruit. We didn’t know what to make of it. It kinda looked like an apple, but when we tasted it, it kinda tasted like pear. So, we dubbed it a “Prapple” and that’s what we called it the entire time we were there. 🙂 They were delicious. Korean pears, are one of the many types Asian Pears. Usually called Giant Korean, since they are the largest. I haven’t found any Giant Korean pears in my area. Yes, they are expensive, and not suitable for pies or cobblers. I have used frozen apple juice, and even bottled apricot juice worked well. I didn’t know it was called as Giant Korean in some parts of the world. It’s always good to learn something new. 🙂 As I don’t have access to Korean pears often, I now just use red apples (royal gala, Fuji, lady finger, red delicious etc) as an alterative and they all do the tricks for me. 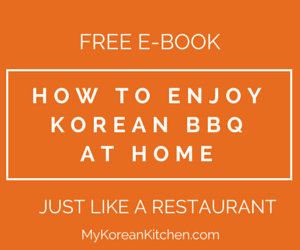 My grandmother always used kiwi in her bulgogi sauce and it turned out fantastic. I’ve seen asian pears (the kind pictured) in the larger supermarkets in the U.S., though. They are a tad on the pricier side, but I’ve also heard bosc is a good substitute. I’ve made my sauce before with just rice vinegar or mirin to tenderize the meat, but I’ll admit it wasn’t as good as with fruit. The recipe for bulgogi my mother brought back from Korea uses no pears. It doesn’t use any fruit. It’s also the best bulgogi we’ve ever had and we compare all bulgogi to that recipe. I’ve never had pear in Bulgogi, the Korean cooks I’ve known have always used honey to temper the bitterness of Sesame Oil, or mixture of other ingredients. However, I think a good substitute for asian (Korean) pears would be Bosc pears. They are crisp, juicy and sweet, as long as they don’t sit around too long. My Korean sister Su’s husband can’t keep his sticky fingers out of her marinating Bulgogi, he prefers to eat it raw after marinnating over night, and he is a good judge as to wether or not it needs more sweetness to cover the bitterness. Try subsituting honey for sugar or other sweetners in Bulgogi, it’s healthier and gives a better flavor! If I was a single man, I could get lost in Korea just traveling around from village to village and sampling all the different varieties and variations of Korean foods. These pears called Nashi, I think, can be found in almost any big supermarket in France recently…I don’t exactly know the period of the year… But they should be found in the exotic fruits section. The first one I bought here was wonderful, really juicy, sweet, and had kind of a rose taste…However, the one I’ve tasted in Korea seemed to taste almost nothing?? Maybe not mature enough? I will have to give this another try when it is pear season here. Japan’s “21st century pear” looks like the Korean version. Fran, It’s good to hear you have had good results from other pears as well. I only mentioned the meat softening part because that is the main purpose. However also because of its sweet taste, I definitely use less sugar than I could have. golden delicious or fuji apple. If you use the fuji, you can decrease sugar or corn syrup if you use those in your recipes. I’ve made Bulgogi using William pears and it was perfectly fine. If pears are used in the Bulgogi recipe, it is – like you said – as a way to soften the marinated meat, not to flavor it. So I think any pear should do, really. It’s more a matter of texture, not taste. And these pears are the yummiest around! Korean fruit is so delicious! I just bought one today for 2000 won. Expensive yes, but worth every bite! I’ve bought Asain pears at Costco before, and some times the regular grocery stores here will have them, but they are expensive and smaller than what I would get at a Korean grocery store.